"I was born at Blunderstone, in Suffolk. There is nothing half so green as I know anywhere, as the grass of that churchyard; nothing half so shady as its trees; nothing half so quiet as its tombstones. The sheep are feeding there, when I kneel up to look out. Here is our pew in the church. What a high-backed pew! With a window near it, out of which our house can be seen. I look up at the monumental tablets on the wall, and try to think of Mr Bodgers late of this parish, and what the feelings of Mrs Bodgers must have been, when affliction sore, long time Mr Bodgers bore, and physicians were in vain. I look to the pulpit, and think what a good place it would be to play in, and what a castle it would make, with another boy coming up the stairs to attack it..."
Blundeston is these days a very pleasant outer suburb of Lowestoft, although wise planners have kept a cordon sanitaire between it and the rampaging new estates of Oulton and Gunton. Everything here is very trim and polite, although St Mary itself has a rather more primitive air about it. 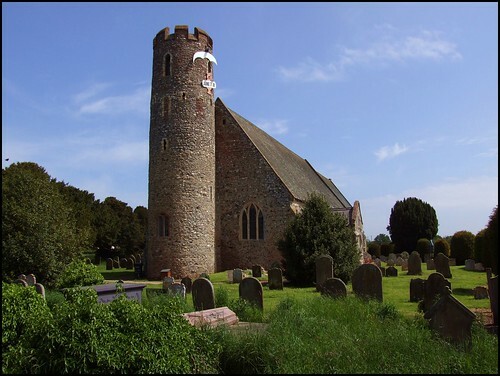 Its narrow, tapering tower rises up sharply beside the steeply banked roof of its nave, for all the world like a Cornish tin mine or Derbyshire mill. This is an ancient building. The tower, at least the lower part, is clearly Saxon, and here inside there are some other ancient details. You step into a church which is much bigger than it might appear from the outside, with a gentle High Church feel to it. The nave was widened in the late medieval period, and although there is no aisle or arcade, the tower has been left offset. The font dates from the 12th century, a plain, octagonal bowl set on 8 relief legs. The tower arch is earlier, and beside it there is a very curious detail. A circular squint hole, about 12 inches across, about 5 feet from the floor in the north-west corner. It is obviously intended to line up with something outside the church, but what, exactly? There is one exactly like it, in the same position, two miles away at Lound. They do not align with each other, though. Perhaps an outdoor Easter sepulchre? or to enable an internal sepulchre to be seen on Good Friday, when the church was out of use? Above the south door, the arms of Charles II are very curious. They have been reused as a hatchment at some point, but the overpainting has faded to reveal the true origin. An altar against the north wall is dedicated to St Andrew, in memory of the nearby former church at Flixton, which was destroyed in a storm early in the 18th century. The font in the churchyard here comes from Flixton, too. And the memorials? Well, I'm afraid there is no 'Mr Bodgers, late of this parish', and probably never was. The high-backed pews are all gone, and although the pulpit would certainly make an excellent castle, it post-dates Dickens's (and Copperfield's) time. The grass is still lush and green in the churchyard though, and much wilder than the neatly trimmed lawns of the very pleasant houses that surround it.